First and foremost, Intel's latest chipset is aimed at the home 'power' user, be this performance enthusiast (read overclocker), extreme gamer or indeed for those who require the ultimate media encoding platform. 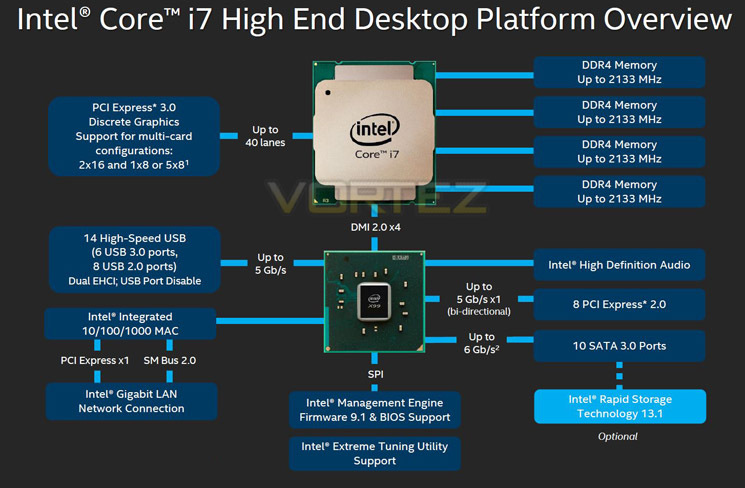 So whatever your vice, Intel have all the bases covered with their latest chipset. This isn't, of course, to say the Z97 based chipset is poor by comparison, it is not but if you want the ultimate - the very best of the best supporting Intel's 8 core processor (5960X) then X99 is the only option. So what's new with X99? The above block diagram shows us that DDR4 is natively supported. Note that DDR3 is NOT supported (more on this later). While the block diagram shows a rated speed of up to 2133MHz, our test bench happily ran 16GB (4x4GB) Quad channel Corsair Vengeance LPX at 2666MHz, with speeds rumoured to exceed 4GHz in the future. Depending on CPU choice, the X99 chipset can support up to 40 lanes of PCIe in combinations of 2x16, 1x8 or 5x8. We also expect this figure to increase on some motherboards with the addition of PLX chips. All of the PCIe lanes are now PCIe 3.0 standard and while current generation GPU's rarely saturate PCIe 2.0, it is nice to have that future proofing available, especially for SLI/Crossfire configurations. One of the heaviest criticisms of X79 was the lack of natively support USB 3.0 ports, especially when compared to its Z87/97 brethren. We are now happy to report that X99 will support 6 USB 3.0 ports along with 8 USB 2.0 ports. OF course, most motherboard manufacturers will also add the usual 'aftermarket' USB 3.0 support from components such as ASMedia and Marvel so transfer speeds of up to 5GB/s can theoretically be achieved. Yet another criticism of X79 was the lack of native SATA 3.0 ports. Despite having huge computational benefits, X79 was crippled by the lack of high speed SATA ports. This has been rectified with the X99 chipset supporting 10 x SATA 3.0 ports attaining a theoretical speed of 6GB/s which can be enhanced using the latest Intel Rapid Storage driver to speeds of 10 GB/s! We must say that Intel have pulled out all the stops here. Clearly they have taken on board user feedback regarding the deficiencies of X79 by incorporating more modern SATA and USB ports. No longer is the Enthusiast flagship the poor I/O brother to Z87/97. Perhaps the biggest draw though is the introduction of DDR4. This will see huge speed gains in almost every aspect of personal computing. With 8x8GB Dimms supported a mammoth 64GB of DDR4 will make the X99 chipset massively future proofed. We will cover the overclocking capabilities of the new chipset and each motherboard specifically in the overclocking section but this area failed to disappoint too. Overall, there is little to criticise here. While we would have liked 40 PCIe lanes regardless of CPU, we understand there has to be some compromise to keep costs down for the budget conscious so how many PCIe lanes you have available will be dictated by CPU choice and not the motherboard. The entry level 6 core i7-5820 will have 28 PCIe lanes at a cost of £299 (At the time of release), while the flagship 8 core i7-5960X will have the full blown 40 lanes available. Aside from lanes, cores cache and clockspeed, all of the X99 features will be available regardless of CPU choice and to this end we are grateful. 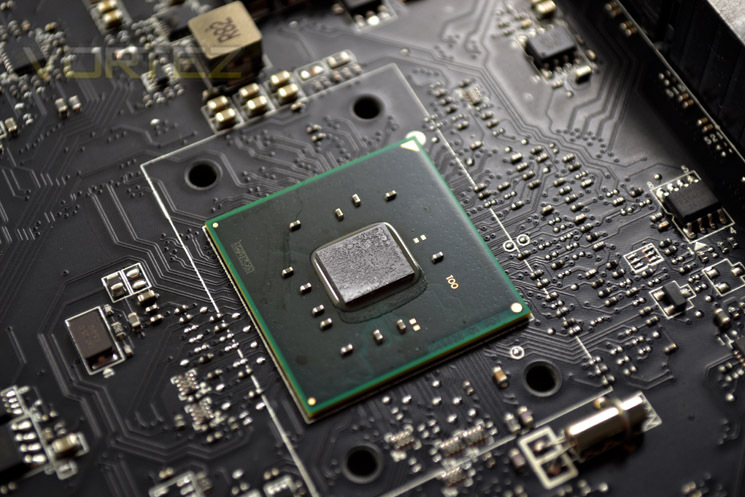 We suspect that future additions to the CPU range will hit the middle ground while the 5960X will receive a speed bump although this is pure speculation at this point. Which chip would we go for? Obviously if money was no object then the i7-5960X is the way to go, not only does it have the full 40 lanes available but it is a true 8 core (16 threads) CPU. The 5930K would be the obvious choice for the consumer and the CPU that we think will prove most popular due to the balance of speed vs. cost. Whichever CPU you opt for though, you can be assured that the X99 chipset offers the very best available. It is powerful, feature packed and as you will see, the unrivalled component of choice for enthusiast users.